So why is it that all of the limited edition collaborations from Levi's end up in Japan? I'd sure like to know. But personal feelings aside, Neighborhood Technical Apparel and Levi's Vintage Clothing put their previous disagreements behind them last season and crafted two great pairs of limited jeans. 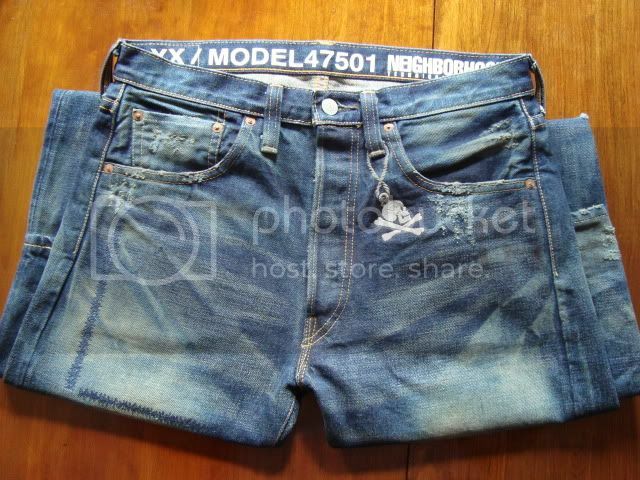 The first to release was the 501XX 1933 a rarely used high waisted vintage model that proved difficult to wear. The second release was the very well known and loved 501XX 1947 model. solifestyle has a pair of the latter on hand. Take a look at our first post in the Jeans! and Neighborhood series after the jump. Levi's is the mother of all denim companies. Their signature leather patch and arc shaped stitching on back pockets exudes tradition and heritage. In the USA they've stayed the course and churned out traditional looking denim for the past hundred years. But in Japan Levi's has created quite a different image for itself. They produce unique and modern cuts, denim with new technologies, collaborations with famous designers and their retail prices regularly top $400. Last season Levi's got together with Neighborhood to produce a pair of highly detailed 501 vintage jeans. 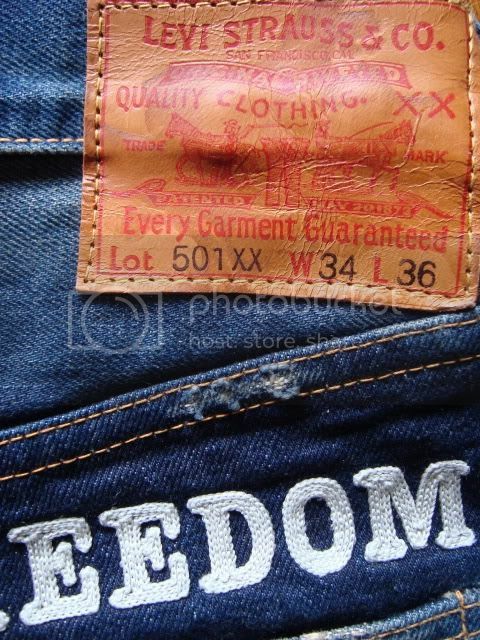 Dubbed 'Destroy Freedom' for the large counter culture message chain-stitched just above the back pockets, this pair of jeans follows a one of Levi's most celebrated vintage cuts- the Levi's 501XX 1947. Crafted with the finest Japanese denim, the jeans feature a heavy used wash with great contrast between lights and darks but not too much to make them look unnatural. They are also heavily detailed with Levi's signature thin redline selvedge, special stitching, damage and scarring. This may be too much for some people, but paired with subtle tops and footwear this pair of jeans can really become the focus of the outfit. The cut of the 1947 501XX is straight leg with a little room to spare and they come with plenty of extra length so that they can be hemmed to your liking. They come treated to give them a bit of rigidity and look great wear after wear. Keep in mind though that the sizing on Levi's Vintage Jeans follows the sizing formula from the year of the vintage they are replicating. That often means you need to size up one or more waist sizes for a fit comparable to today's Levi's Jeans. In this case I had to buy waist 34 for it to fit like my normal waist size- 32. Take a look at the more detailed images below and let us know what you think. True to Neighborhood's counter culture brand focus the jeans are dubbed 'Destroy Freedom.' 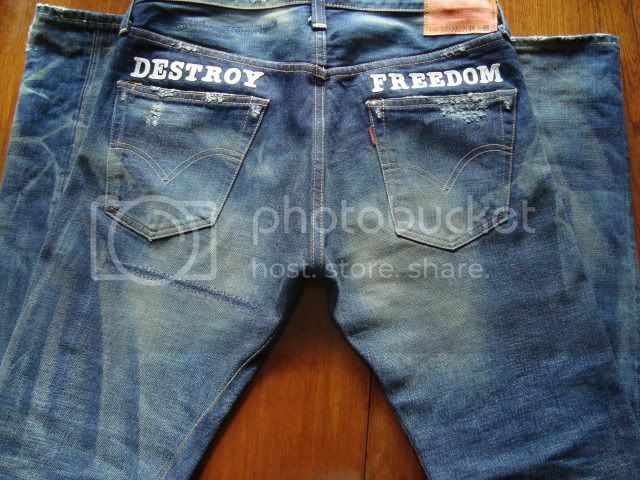 This message is stitched above the back pockets with feature the Levi's arc stitching. 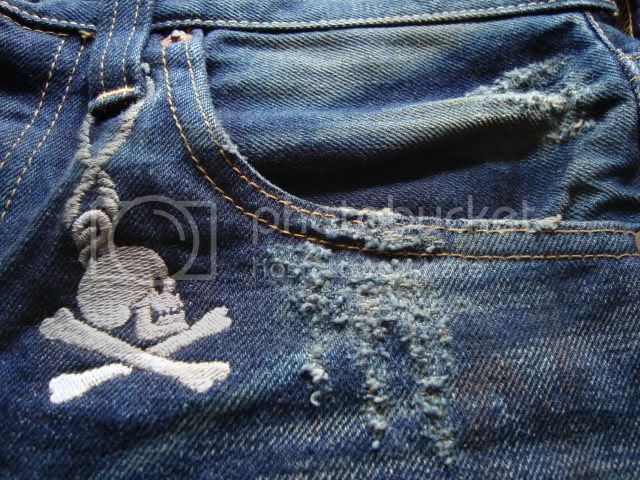 Also below the left back pocket you will see some scarring which is used on the front and back of the jeans.